The EasyMarquee is a high visibility, industrially toughened display that is robust and easy-to-use. Large, bright LEDs mean high visibility from distances up to 30 metres, enabling the Easy Marquee to display plant status messages clearly and reliably. The EasyMarquee combines features of standard Marquees with easy-to-use programming options, high visibility, and a durable powder coated steel casing. Programming messages is simple with the EasyMarquee. Create up to 128 messages at any one time using the supplied Windows Software. Then simply hook up your PLC outputs for direct interface with Easy Marquee. 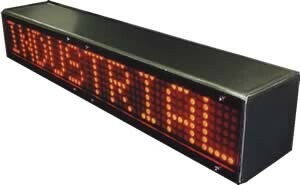 The large, bright red LED display is clearly visible from distances of up to 30 metres - to visually communicate plant status and operational messages. Choose from either 50mm or 100mm characters, and casting length options that accommodate characters of 10, 20, 30 or 40 characters per line. Even the highest visibility display can sometimes escape notice on a busy factory floor. This is why the EasyMarquee has the option to trigger flashing lights and sirens when priority messages are activated.